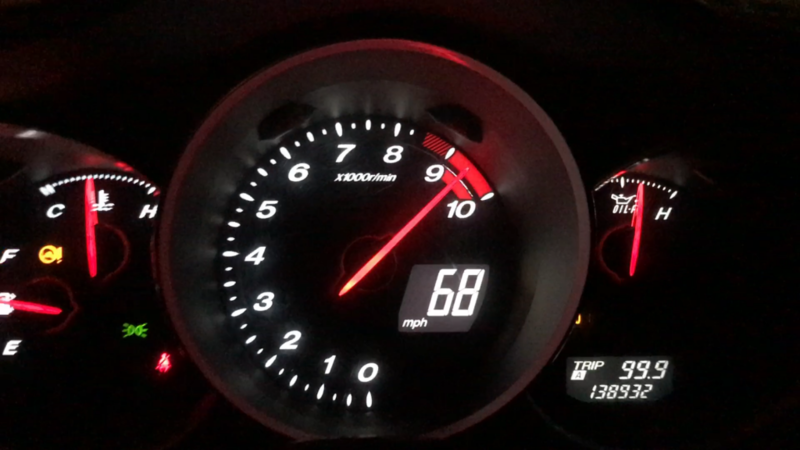 Purchased this RX-8 with a dead engine. After rebuilding it at home, this is my break-in run to help flush out the block. Car is daily driven 45 miles round trip, mostly highway, so I rack up the miles quick, changing the oil practically every 2 weeks or so. The capacity is 7 quarts but only 4 drain out during an oil change due to the engine having TWO (2) oil coolers, which hold a bunch of oil along with the oil lines, etc. I do a quick drain n fill, leaving the oil filter on to continue doing it's job. Takes me 5 mins. No big deal. Not sure how long to run it... these engines are hard on oil and I beat the snot out of it daily. I just want it to last, since these fail due to Lubrication related wear on the Apex Seals. Any recommendations? Haha. 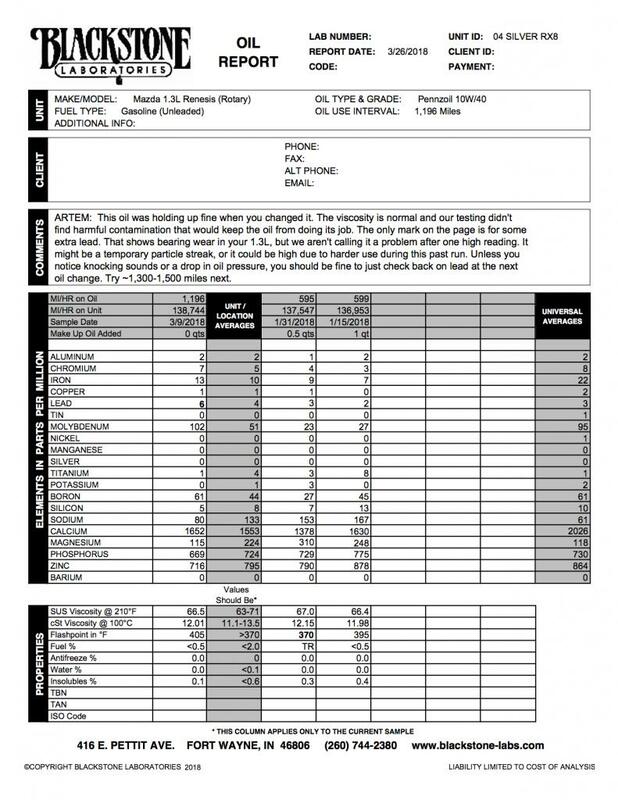 Previous 600 mile runs were on Valvoline 10w40 conventional from Autozone clearance. Do you run two stroke oil to help lube the combustion chamber? If I had a rotary, that would be something I'd do. With this much oil being left behind, filtration would be also a concern. Also, I'd go through Polaris for analysis to keep tabs on oxidation and things. Funny, there is a mention of residue. A pure(er) base vs VII loaded one would be cleaner burning, wouldn't it? The fear of synthetics never made sense to me, this is also widely feared by many motorcycle peeps, " your clutch will [insert assumption]". Gorgeous car! I've heard that rotaries have greatly improved rotor apex seal life if 2-stroke oil is added to the fuel. I'm not sure what the recommended ratio would be, but I'm sure there's lots of good advice out there. Many rotary guys add 2 stroke oil to the fuel to lube the apex seals. 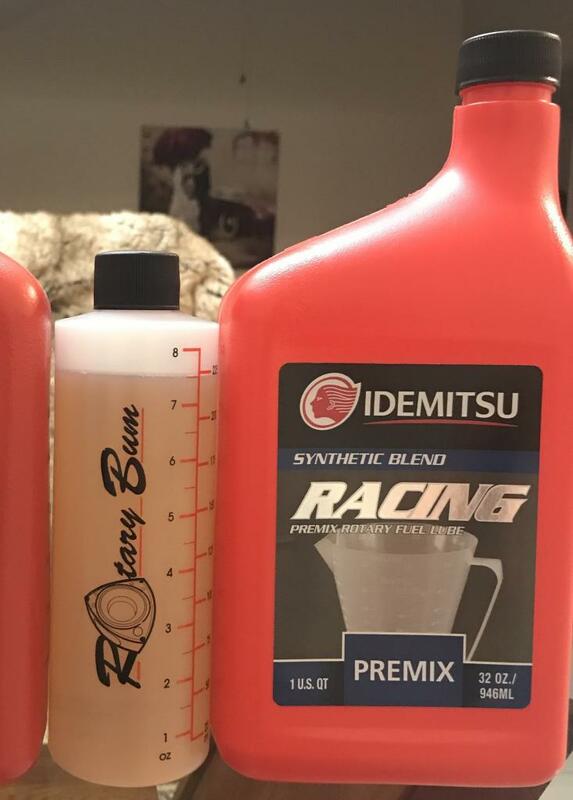 I actually use a Rotary specific Pre-Mix Lube added at the recommended 0.5oz per gallon of fuel to help with Apex Seal Lubrication. I dump 7.5oz with every 13 gallon fill up. Would love do to a standalone lube injection but those things are expensive. I figured with frequent oil changes + Pre-Lube, the engine should last a good while for me to enjoy my investment / time. See previous reply about using Rotary specific Pre-Lube that I add to the fuel @ 0.5oz per gallon. You know, I thought about adding an Amsoil bypass filtration kit, to make sure the oil is super clean and free of particles... haven't pulled the trigger on it yet. Greg24, do you see how shiny that Mazda is? Not sure what the big deal would be. 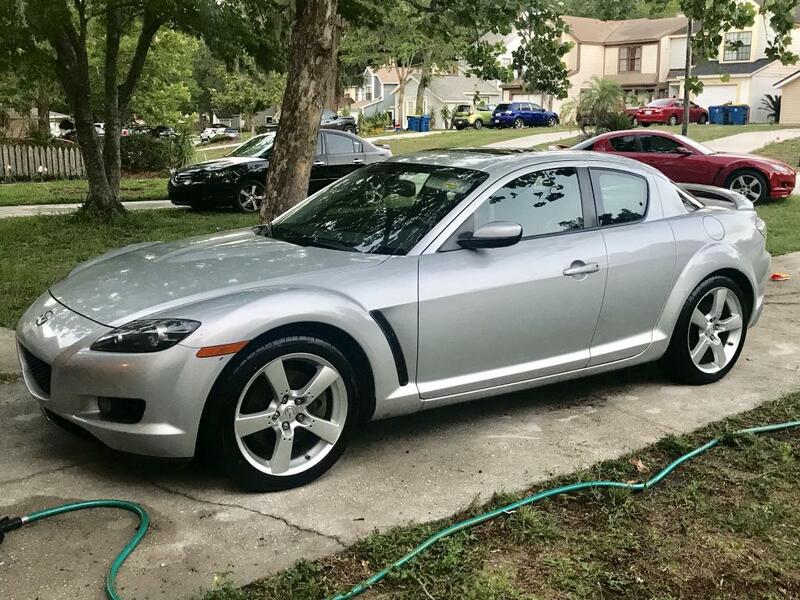 There are several guys on the RX-8 forum using Mobil 1 0w40 for a long time. They haven't posted anything negative yet. As long as it burns clean, I don't think it matters. 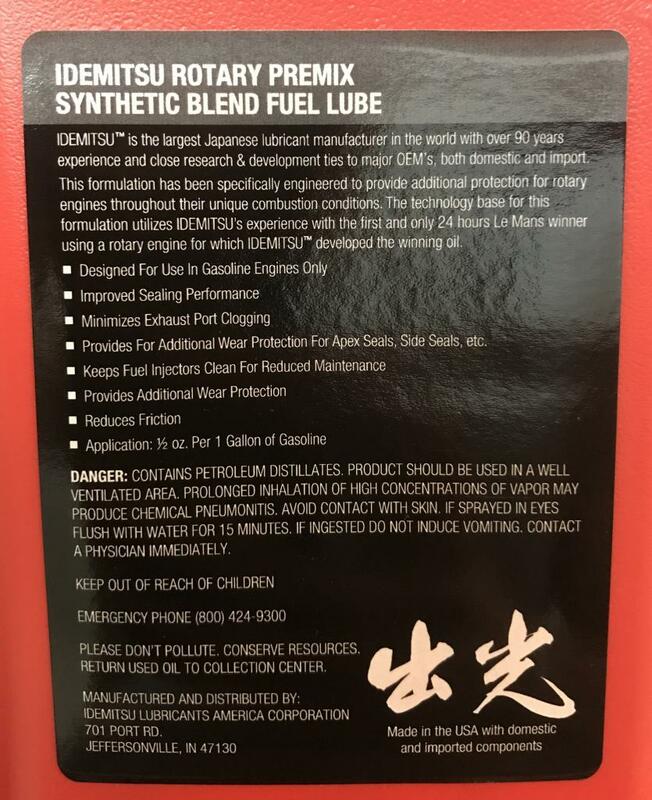 I can understand if using a high end synthetic which was designed to resist break down in the Rotary engine that this could cause build up, etc to occur due to the oil not wanting to burn cleanly. I'm sticking to conventional for now but some Rotary engine builders suggest a synthetic blend. Take the route down the middle they say. haha. i miss my 06 Shinka, i sold mine with just over 180K on it, ran awesome and lived on supertech 10/40 and TCW3 oil in the fuel. was an amazing car. Curious, what sort of oil temps does this thing see during spirited driving? With how often you change the oil, nothing wrong with conventional (other than perhaps deposits depending on heat), but I think a lot of the theories about not running synthetic in rotaries has been disproven these days. I used to be into rotaries, and the few guys I still follow on Instagram with built turbo rotaries all run synthetic. Maybe the Renesis is different? Sizzling oil temps, probably, hence the need for two oil coolers. I haven't installed an oil temp gauge yet. I just closely monitor coolant temps via a Scan Gauge II mounted on the dash. I'm all pro for synthetic, if I can find one that burns clean. It would obviously offer better protection, so it's a no brainer. Cost would be the only downside for me. The current 10w40 conventional I picked up on clearance costs $2 a quart. It would be hard for me to dump synthetic every few thousand miles @ $8-9 a quart.